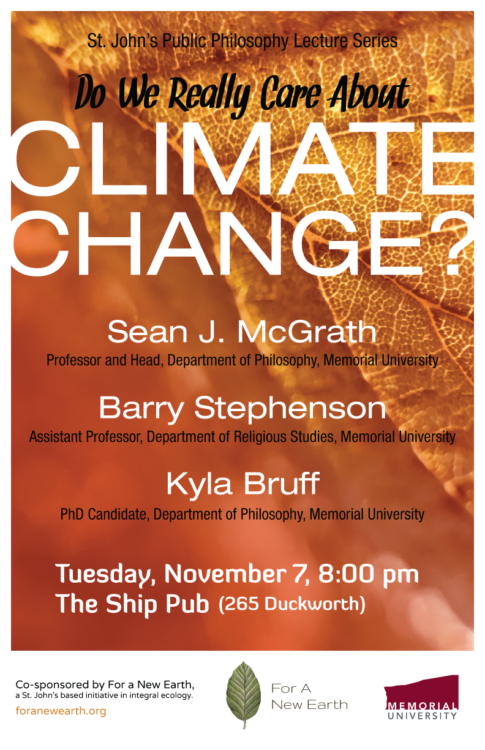 On Tuesday, November 7th at 8pm, three members of the For A New Earth team will publicly discuss the question “Do We Really Care About Climate Change?” at the Ship Pub. Is the answer hopeful, pessimistic, pragmatist, or otherwise? More specifically in recent months, in view of Trump’s defection from Paris, the rise of one populist government after another in Europe, the worst summer on record for heat and dangerous storms, and the resignation of climatologists that we will not meet the Paris targets, we are prompted to ask: Why don’t we care? Why do we proceed on a path of self-destruction when we know better? Why don’t we do what we know we ought to do? Please join us on Tuesday at 8pm, as Dr. Sean McGrath, Dr. Barry Stephenson, and PhD Candidate Kyla Bruff discuss the most pressing issue of our time–and why some don’t seem to mind. Archive: Do We Really Care About Climate Change? This entry was posted in climate change, events, podcasts and tagged Climate Change. Bookmark the permalink.